The Brandeis undergrads who went to Mississippi to work for social justice [“Mississippi Smoldering,” Fall 2011] resurrected my own perilous journey 50 years ago this summer. In those days, when “the woods were burning” and the Klan and lynchings were still a reality, I dropped out of Brandeis (shhh!) at the end of my junior year and hitchhiked to Jackson to save the world, just as Brandeis had taught me. I was a fledgling journalist, and my new nest was The Mississippi Free Press, a fearless weekly banged out on an Underwood typewriter in the back of a black supermarket off the aptly named Lynch Street. In that segregated, right-to-work state, we championed the twin virtues of civil rights and labor unions. It was civil rights icon Medgar Evers, lean as a shortstop and crisp as a colonel in the shirts his wife, Myrlie, pressed, who first mentioned Clyde Kennard to me. Kennard was then serving seven years in Parchman State Penitentiary. His alleged crime: He had stolen $25 in chicken feed from a Hattiesburg feed lot. His real crime: He, a black man in Mississippi, had applied to the all-white University of Southern Mississippi, then called Mississippi Southern College. The state had framed him to prevent him from matriculating. I researched the story, wrote a series for The Free Press and sold a piece to Reporter magazine. Attorney General Robert Kennedy intervened, and Kennard was released just in time to die of cancer that had gone untreated. I went back to Brandeis and got my degree. Mississippi Southern was integrated five years later. The writer is a professor of journalism and director of Jewish American studies at Montclair State University. 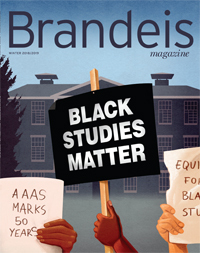 To read more about Hollander’s experience in civil rights-era Mississippi, visit go.brandeis.edu/magazine/Hollander. I was delighted to open my alumni magazine and see how current Brandeis students are learning about the civil rights movement in Mississippi. Many Brandeis students participated in the movement. I left the day I graduated to begin working in Georgia and, after that, in Mississippi, as a community organizer with the Student Nonviolent Coordinating Committee. A partner and I went door to door in the black community talking to people about joining the struggle to end segregation and gain the right to vote. It was dangerous work in the Deep South of the 1960s. We used land lines to keep track of one another for safety reasons, even though our phones were tapped by the local police. So Mendy Samstein ’60 traded reports about threats, violence or arrests in Hebrew with Bill Light, a Stanford graduate. Aviva Futorian ’59, who worked in Benton County, Miss., was the only white woman I know of to lead her town’s civil rights workers. I was the first white woman to work outside of Jackson, the capital. Since it was unimaginable in Mississippi in 1963 that a white woman would live in and help the black community, many assumed I was a light-skinned African-American. At that time, the local white officials decided who could and who couldn’t vote. They disqualified all but a token number of blacks by asking questions like, “How many soap bubbles are in a bar of soap?” So my first Mississippi project was to help organize a mock election, in which more than 40,000 Mississippi blacks voted. This was the start of our struggle in Mississippi for the right to vote. You can also visit the Civil Rights Movement Veterans Website to find information from those of us who worked in the movement. As associate provost for innovation and executive director of the Office of Technology Licensing at Brandeis, I am a strong believer in the benefits of industry collaboration with academia. That’s why I was disturbed to read “Big Pharma on Campus: A Prescription” [Fall 2011]. Few biomedical discoveries would make it to market, and few new drugs would make it to patients, without just the kinds of industry-academic collaborations Alison Bass criticizes. I fear that articles like this one will lead readers and policymakers to misunderstand the risks and rewards of university-industry collaboration. NIH-funded research at universities and academic medical centers has led to more than 100 new drugs and vaccines coming to market. None of these would be commercially available without industrial partners to fund the product development and clinical trials. For example, at Brandeis, biology professor Neil Simister, along with his colleagues at Brigham and Women’s Hospital and Children’s Hospital Boston, made a discovery in immunology that led to a novel treatment for hemophilia. The therapy is now being tested in humans in Phase III clinical trials. The basic research was done at the three academic institutions, but the product development is being led by our corporate licensee, Biogen Idec. Without this relationship, this great scientific discovery would have remained just that — and those suffering from hemophilia would be deprived of a therapeutic advance. It is the collaboration between academic research institutions and industry that allows these discoveries to become products that benefit the public and the taxpayers. The potential for conflicts of interest between pharmaceutical companies and academic researchers does exist, and it is more acute in academic medical centers where clinical trial research is being conducted. But thoughtful regulation, via appropriate conflict-of-interest policies, will allow this productive part of our economy to thrive while preventing abuses. When we were seniors in 1990, living in Mod 30, we decided to invite President Evelyn Handler to dinner at our place. We don’t recall that we had a particular agenda other than seeking the ear of the president to share our experiences at Brandeis. Besides, we thought, she would never accept, so it wouldn’t really matter why we had invited her. Nevertheless, we dashed off an invitation and sent it to her office. Lo and behold, a few days later, we received a return letter from President Handler suggesting a date when she and her husband, Eugene, could join us for dinner. That could mean only one thing: We had some serious cleaning to do. When the night of the big dinner arrived, none of us knew what to expect. Would she be friendly? Would she pepper us with questions? Would she be willing to accept ours? Would she be tight-lipped or able to share “secrets”? Most important, would she be willing to eat our amateurishly homemade meal? None of our apprehensions was realized. Dr. Handler and her husband were completely approachable and ate heartily, fully willing to accept our complaints (not that we had many) and also willing to share some of the university’s plans for the future. She stayed with us for nearly two hours, conveying to us, in no uncertain terms, that having the chance to talk with us was important to her. And we were grateful. We were also grateful for the five-pound Hershey’s bar she brought us as a gift. Perhaps the most memorable part of the evening was when President Handler accepted our challenge to play some pinball. (Brian had purchased an authentic 1950s pinball machine at a garage sale a few weeks earlier.) She was actually fairly good and, we’re pretty sure, beat her husband’s score. To this day, we recall that evening with a real fondness for President Handler, and we were saddened to learn of her untimely passing (see p. 94). For us, that evening stands as a moment that speaks to the real power of Brandeis to capture significance through personal relationships. The fact that we six modmates still spend every New Year’s Eve together is testament to that. Due to a typing error and editing oversight, a news item in The Brief section of our most recent issue [“Encounter of the Peaceful Kind: Alumna in the Nobel Circle,” Fall 2011] misidentified on second reference the home country of Olubanke King-Akerele ’67. King-Akerele, a Wien scholar, has a long record of public service in her native Liberia. After spending two dozen years working for the United Nations, she took on new challenges as minister of commerce and industry and later minister of foreign affairs under Liberia’s 24th president, Nobel Peace Prize winner Ellen Johnson Sirleaf. With deep apologies for the confusion (and a good dose of embarrassment), we thank her several classmates who wrote to point out our error.